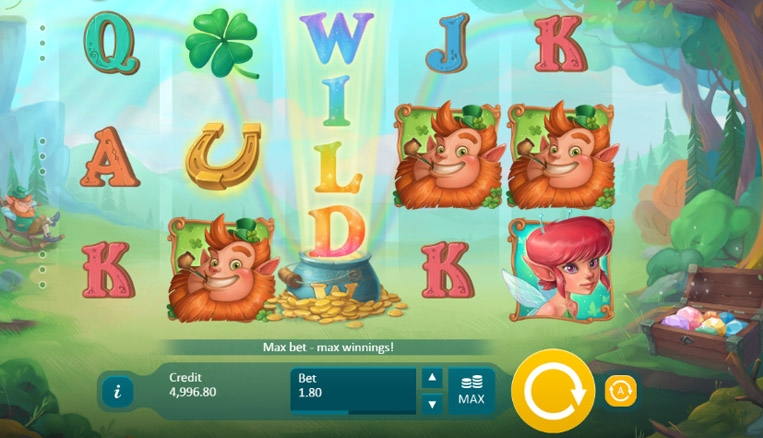 Clover Tales is another fantastic addition to the Irish themed genre of online casino games at Wizard Slots. With a game board that hovers above a quaint and serene Irish cabin in the woods, you can spin through reels of horseshoes and tobacco pipes as the friendly, bearded Leprechaun watches on from his rocking chair. It’s rare that you’ll come across a bad Irish themed game, but with zero risks, there are zero rewards. With a steadily growing reputation for delivering innovative physical and digital gaming solutions, Playson is adding to their already extensive catalogue of 40+ slot games to try today. Intertwining their ethos of creating original games, with their understanding of what makes a classic slot game, from their Maltese home base they are developing and providing entertainment to casinos and customers around the globe. Deep in the heart of an immersive, mystical forest, is a small, picaresque grove. Its only inhabitant lives in an unassuming cabin and whiles away the days smoking his pipe and relaxing in his wooden rocking chair outside. That is unless it’s one of the days he decides to give a four-leaf lucky visitor a chance at taking home with them some of his endless wealth. For the man in the rocking chair, outside the cabin, and deep in the forest, is actually a magical leprechaun – capable of dishing out a jackpot of up to 750x our stake! Given this jackpot, who wouldn't consider this the best-rated slots to play? This charming 5 reel, 27 payline online slots from Playson captures all the grace of a peaceful forest and all the magic of a cheeky game of chance. Despite its tranquil setting, the Wilds feature within the game is impressive, with the Golden Pot capable of expanding across reels 2, 3 and 4 – and it even shows up randomly during awarded Free Spins, and still expands again even during this bonus feature. The Free Spins are activated when either the Leprechaun himself or his Fairy woodland friend, land 3 times on the reels. If the Leprechaun, or the Lucky Horseshoe land 3 times in a row on one of the reels, a Rainbow Line is activated, triggering additional Free Spins or Re-Spins. 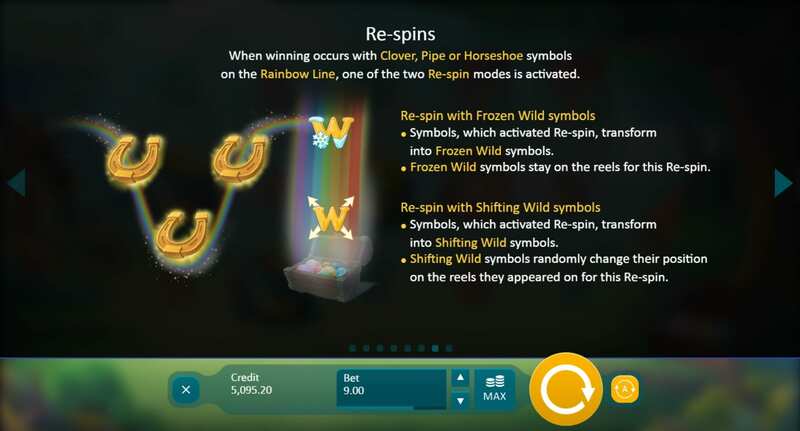 During the Re-Spins, the Wild symbols are either frozen, or shift, but always stay on the screen until the bonus is over. The Rainbow Line is undoubtedly the game’s most fun individual quirk. Its path across the reels is random, but as soon as Wild lands on the Rainbow there is a chance to build a steady stream of substantial wins. Throw in a tiny sprite – who is herself chucking the random Wilds into the bonus Free Spins – and we see a change in the weather, hear a dramatic climax building up in the audio, and see the Total Win pot building and building. While the game is not the most graphically amazing, it doesn’t need to be, as the cartoonish characters and symbols fit with the playful charm at its essence. The animations and sound effects that take over when the wins start to land are a wonderful feature of a captivating Playson title. For more slot promotions please click here. The Pot of Gold at the end of the Rainbow (or, anywhere across the Rainbow!) is suddenly within reach here at Clover Tales. We love watching those wins build up, and eagerly looked out for where the Rainbow would fall on the next spin. 10/10 for entertainment alone is a worthy reward for this charming online slot. Another 10/10 slot is foxin wins.